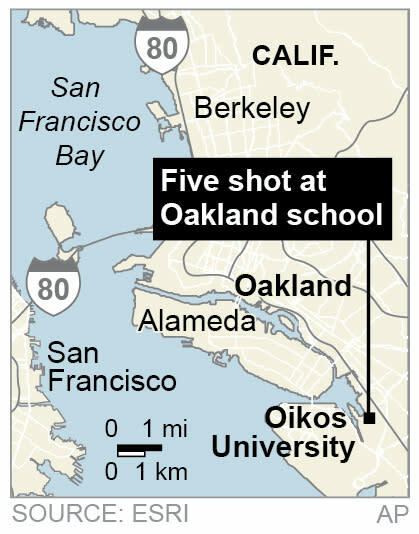 Map locates Oikos University in Oakland California, where five people are shot. 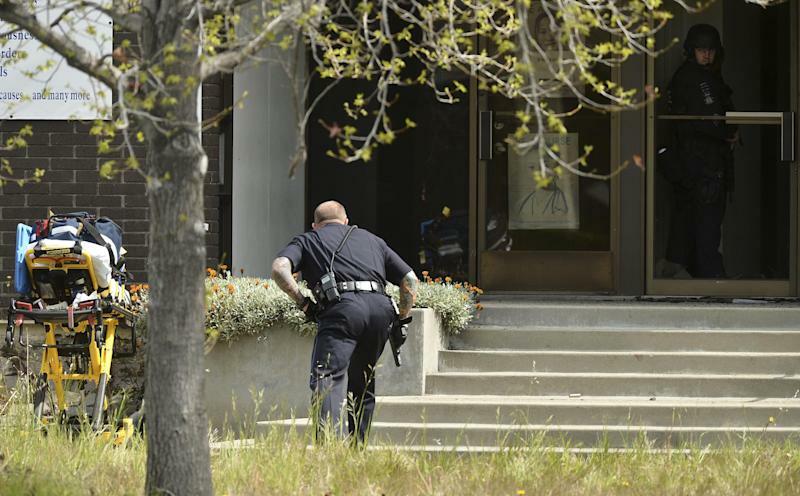 OAKLAND, Calif. (AP) — A gunman opened fire at a Christian university in California Monday, killing at least five people, law enforcement sources close to the investigation said. Police say they have a suspect in custody. The shooting erupted at midmorning at Oikos University in Oakland and left five dead, law enforcement sources told The Associated Press. They requested anonymity because they were not authorized to release the information. Officer Johnna Watson did not give any other details about the detained suspect. Authorities earlier described the gunman as a heavyset Korean man in his 40s wearing khaki clothing. "I can confirm that we do have one person who has been detained that we believe is possibly responsible for this shooting," Watson said. Earlier, television news footage showed a chaotic scene as heavily armed officers swarmed into the building in search of the shooter. The footage also showed bloodied victims on stretchers being loaded into ambulances. Pastor Jong Kim, who founded the school about 10 years ago, told the Oakland Tribune that he heard about 30 gunshots in the building. Angie Johnson, 52, told the San Francisco Chronicle that she saw a young woman leave the building with blood coming from her arm and crying: "I've been shot. I've been shot." "She said he looked crazy all the time," Johnson said the victim told her, "but they never knew how far he would go." Four victims arrived at Highland Hospital for treatment, said spokeswoman Jerri Randrup. According of its website, Oikos University offers studies in theology, music, nursing and Asian medicine. Phone calls to Oikos were met with busy signals Monday and its website was slow.